West Indies 6-166 (Dwayne Bravo 46, Darren Sammy 42, Mohammad Hafeez 1-15) beat Pakistan 82 (Mohammad Hafeez 19, Shahid Afridi 18, Samuel Badre 3-10, Sunil Narine 3-16) by 84 runs. The Windies amassed 166 runs for the loss of six wickets in 20 overs and Pakistan was bowled out for 82 mere runs with 13 balls still available. Dwayne Bravo (West Indies) was announced ‘Player of the match’ for his match winning knock of 46. The ICC World T20 -32nd Match, Group 2, was played on Tuesday, April 1, 2014, at Shere Bangla National Stadium, Mirpur. Earlier, Darren Sammy, the skipper of West Indies, won the toss and preferred to bat first. They lost two quick wickets at 22 when Marlon Samuels and Lendl Simmons tried to gather the innings. The latter opted to attack and hit a few boundaries in the process but was unluckily run out at 61 for 31. His partner followed him six runs later for 20 and Denesh Ramdin became the fifth victim at 81. 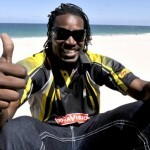 Sammy and Dwayne Bravo got together and changed the complexion of the game with excellent hitting. They shared a sizzling partnership of 71 runs off just 32 deliveries when the latter was run out for 46 off 26 with 4 towering sixes and 2 fours. Sammy remained unbeaten for 42 from 20 comprising 2 big sixes and 5 fours and took his side to 6-166. Mohammad Hafeez, Sohail Tanvir, Zulfiqar Babar and Shahid Afridi were the successful bowlers with one wicket each. The Green Shirts had the worst start by losing their four top order batsmen for just 13 runs. Sohaib Maqsood joined in with his captain Mohammad Hafeez but they found it difficult to score the runs at ease. 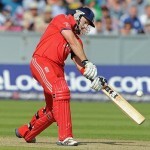 They crept to 37 in 10.3 overs as the latter departed for 19. The first did not stay longer and went back to the pavilion five runs later for 18 and Pakistan was reeling at 6-42 in 11.3 overs. Shahid Afridi and Sohail Tanvir contributed 18 and 14 runs while their entire innings was squeezed for 82 in 17.5 overs. Samuel Badree and Sunil Narine were the champion bowlers with three wickets each whereas Krishmar Santokie and Andre Russell shared two each. West Indies grabbed the encounter with a mighty margin of 85 runs and qualified for the semi final.